Love from the Kitchen: Pay it Forward! 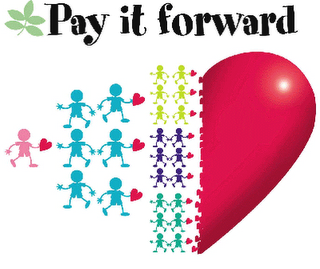 Last month I participated in a "Pay it Forward" that Ginette hosted. I received in the mail a wonderful Christmas-themed package. Thanks Ginette! The rules state that the exchange focuses on doing an act of kindness without expecting anything in return other than that the recipient will, in their turn, pass the kindness along... Paying It Forward. Now it is my turn. I will send a little something to the first three blog owners who post a comment on this entry. In turn, those three will post this information and pick three people carrying on the giving. This is fun! I'm really looking forward to sending out some packages! This sounds like such fun!! Count me in! Me too! Just let me know what I need to do!